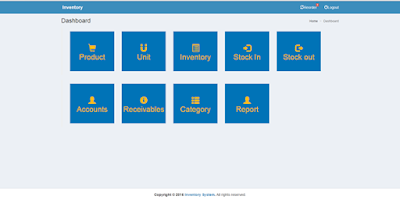 This is a simple Inventory Management System that will support management of all items, reorder points, and inventory records for efficient and accurate inventory management. This will help the organization to easily keep track inventory reports, to easily identify what products needs reorder. The system will also support decision-making by providing an up-to-date and accurate sales and inventory report. Here are the sample screenshots of the inventory system with sample dummy data. Notifications for products that needs reorder. The user of the system will be the administrator. Inventory Management System's main function is easy management and inventory of products and customer accounts. This system is made of bootstrap for the interface/design and PHP for the scripting and MySQL for the database. You can download the zip file of the inventory management system on this inventory management system and extract it in your www folder if your using LAMP/WAMP and htdocs if your using XAMPP.